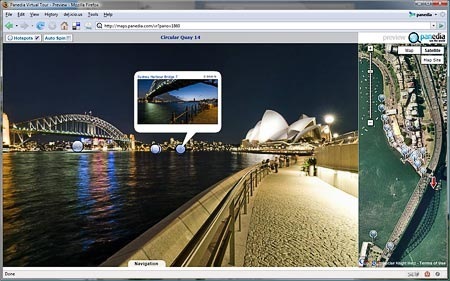 http://maps.panedia.com is our ‘MAPS’ site…big map, small panoramas by default. 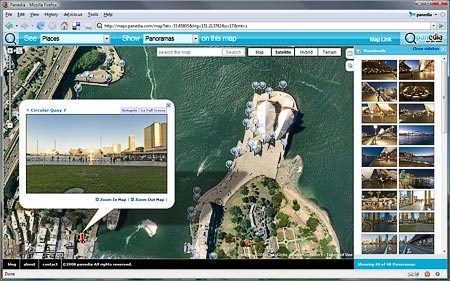 http://pano.panedia.com is our ‘PANO’ site, fullscreen panoramas, dynamic hotspots and small map. Both sites use the same content, albeit in different sizes and formats, but they present the world in a very different way. ‘Maps’ is a top down look at the world, whereas ‘Pano’ is a ground based tour through the world. OK simple explanation over, lets look at the details. 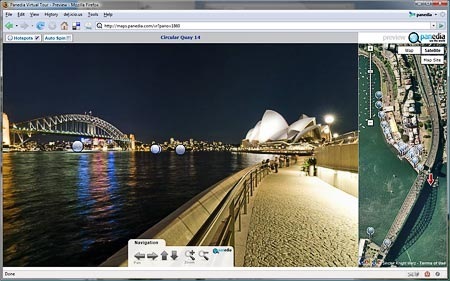 In the Pano site we’ve managed to integrate the panorama and google maps completely. So mousing over a hotspot in the panorama updates the map, while mousing over a marker on the map, updates the panorama. All the hotspots inside the panorama are dynamically generated based on a number of factors in our algorithm. Each hotspot when moused over opens a large thumbnail image of the view from that panorama position. 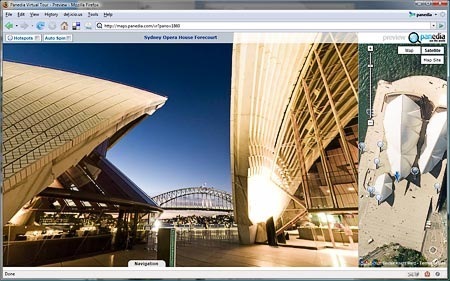 The hotspot window also contains the distance & bearing to that panorama from the one you are in. Of course you can turn the hotspots off an enjoy the view anytime using the ‘Hotspot’ checkbox on the top left of the window. When you mouse over a hotspot in the panorama, the map scrolls or jumps (depends on the distance) to the marker you are viewing. 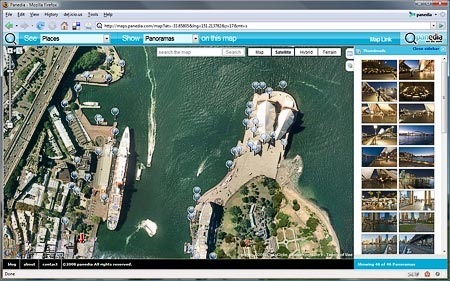 This gives you an aerial view of that location, while the hotspot shows you an image from that location. Clicking the hotspot or map marker will take you to the clicked panorama. When you mouse over a marker on the map, the hotspot in the panorama view will contain a locating arrow and hotspot to show you the approximate position of the panorama you have selected. At any given time the map contains a lot more markers than the panorama contains hotspots, so there are many more options to view on the map side. 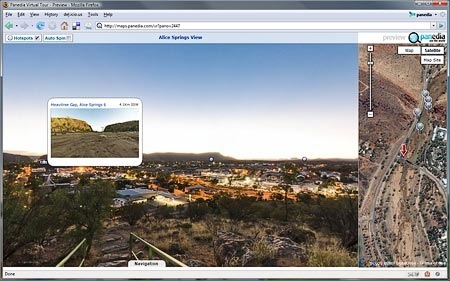 ‘Map Site’ button takes you to the Big Maps view. ‘Maps’ View for exploring large areas. Small panorama in ‘Maps’ view. Click ‘Hotspots’ in small panorama window. 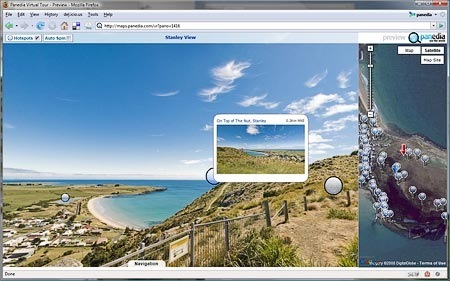 ‘Pano’ site showing Navigation Panel at the bottom. The final item to note is the navigation panel at the bottom of the panorama. You don’t need to use this, but it’s there if you want it. So there you have the basics of our new site. Of course it’s much quicker to go to the site and use it for a minute… the site is extremely simple, and a lot of fun. The site is in preview mode, with plenty of items we’re still working on. Please feel free to comment, let us know what you like and what you don’t…and please let us know if something doesn’t appear to be working right on your system. Its great to see it out there!! It is a very clever use of FPP. Its great to see Ricks new work! That’s awesome. Can’t wait to see what’s next.